← The Sports Archives Greatest Moments – 2010 SF Giants win World Series! Tommy McCarthy, selected to be a member of Baseball’s Hall of Fame in 1946, is credited with establishing baseball’s Infield Fly Rule. When there are fewer than two outs and with base runners on first and second McCarthy would purposely miss an infield fly ball that was easily playable to start a double play. The Infield Fly Rule was established to prohibit this practice. 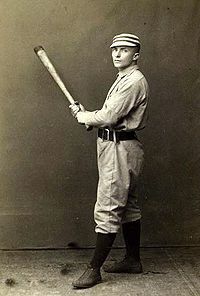 Tommy McCarthy, who played for the Boston Beaneaters and Philadelphia Quakers in the late 19th century is also known for being instrumental in establishing baseball’s hit-and-run play. This entry was posted in Baseball and tagged Boston Beaneaters, Infield Fly Rule, Philadelphia Quakers, Sports Archives, sports history, Tommy McCarthy. Bookmark the permalink.